I have always had a love of affair with the city of New Orleans. I have traveled there nearly ten times since my early 20’s: for work a few times, but more often, to visit our growing number of dear friends who live there. I love the warmth of the city, the vibrant culture and history, the music, and of course, the food. While I enjoyed many delicious eats over my travels to the city, the first time I tasted a King Cake was three years ago, just a few months before our daughter was born. I was seven and a half months pregnant, waddling around Mardi Gras with an enormous protruding stomach, enjoying every moment, especially all the food. To welcome us to the Mardi Gras festivities, our dear friend Melanie arrived with a beautiful, colorful King Cake from Cake Cafe. This was no ordinary King Cake – it was stuffed with goat cheese and apples, and it was one of the best treats I have ever enjoyed. So much so that each year since, my husband longs to have another one, but there is just nothing comparable in the New York area. For those not familiar with a King Cake, it is a Christian tradition that marks Kings Day (when the three kings brought gifts to baby Jesus) and so a small baby Jesus is traditionally baked inside a King Cake. It also marks the coming of Mardi Gras season in New Orleans, when it’s commnon to encounter many varieties of King Cake throughout the city between early January and Mardi Gras itself. A King Cake should also not be confused with The King’s Cake, or a galette des rois, a beautiful French pastry that, to me, tastes like an enormous, buttery almond croissant. You may see it in your local bakery topped literally with a crown. 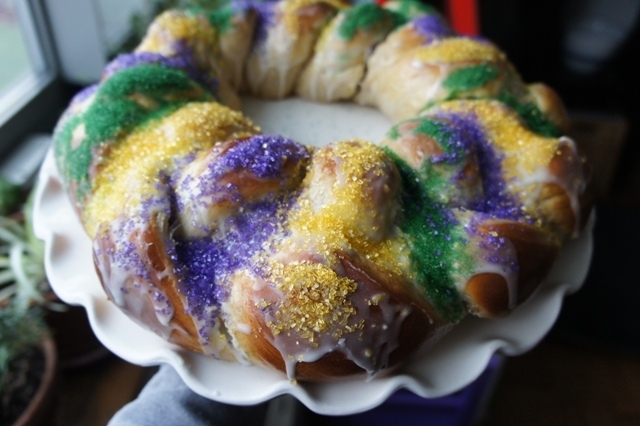 It is absolutely delicious as well, but different from a King Cake. 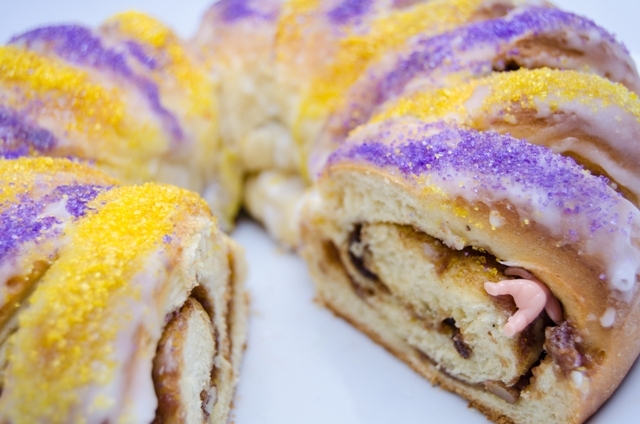 A King Cake in its modern form tastes most closely to a cheese danish or Entenmann’s coffee cake. So what is a challah queen like me supposed to do with a love of King Cake, but no quality one available? 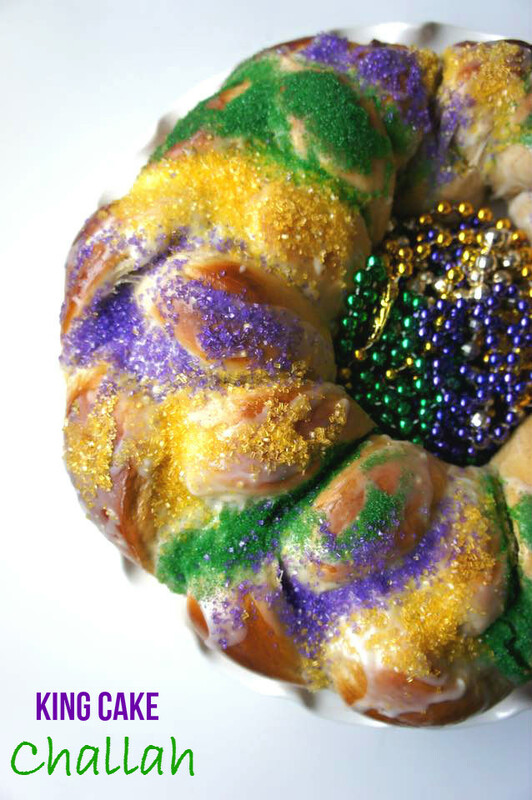 Make a king cake challah of course. I flavored the dough with some traditional king cake flavors, such as cinnamon, nutmeg and lemon zest. But the most fun parts of this challah creation are the icing and the colorful sprinkles. Gold, purple and green are the colors of Mardi Gras, and are the distinguishing factor between merely a round cheese danish, and a King Cake for Mardi Gras. I didn’t bake a baby Jesus in the challah of course, but it would be perfect with a cup of coffee in the late afternoon. Or for breakfast, who am I to judge how you start your day? And while it won’t ever be the same as the amazing version from our time in New Orleans, at least it brought back some fond memories of New Orleans and our dear friends who welcome us back time and time again. In a large bowl or stand mixer fitted with the whisk attachment, mix together 1 ½ cups flour, salt, cinnamon, nutmeg, lemon zest and sugar. After the water-yeast mixture has become foamy, add to flour mixture along with oil. Mix thoroughly. Add another 1 cup of flour and 2 eggs and mix until smooth. Switch to the dough hook attachment if you are using a stand mixer. Add another 1 ½- 2 cups of flour, mixing thoroughly and then remove from bowl and place on a floured surface. Knead remaining ½ cup flour into dough, continuing to knead for around 5 minutes. Preheat oven to 350 degrees. Split dough into three even pieces and form into three long snake shapes. Braid challah and form into a circle, pinching the end tight. Place on a parchment or silpat lined baking sheet. Allow challah to rise another 45-60 minutes, or until you can see the size has grown and challah seems light. This step is very important to ensure a light and fluffy challah. In a small bowl beat 1 egg lightly for the egg wash.
Brush egg wash liberally over challah. If making one large challah, bake around 27-28 minutes. While challah is baking, whisk together milk, powdered sugar, vanilla and lemon zest for the glaze. After the challah has cooled out of the oven for around 20-30 minutes, glaze challah covering as much surface as you can. Immediately cover with sprinkles in a decorative pattern. Allow to dry before serving.